The Los Angeles City Council agreed to raise the city’s minimum wage by more than a dollar per hour each year until the amount reaches $15 an hour by 2020, city officials said on Tuesday. The measure would affect the finances of 800,000 people. Based on a 40-hour workweek, the raise would amount to an additional $48 a week or approximately $2,000 a year before taxes for the next five years. Los Angeles is now the largest city to adopt major a minimum-wage increase, joining three others that have passed similar legislation: Chicago, San Francisco and Seattle. The move also puts pressure on other large urban centers, such as New York, to do the same. "Make no mistake," said Councilman Paul Krekorian, the measure’s sponsor, according to the Los Angeles Times. "Today the city of Los Angeles, the second-biggest city in the nation, is leading the nation." The measure also ties yearly wage increases to the consumer price index starting in 2022. In Krekorian’s original measure, an amendment was included that would have required employers to grant workers 12 paid days off each year. There was a huge outcry from the business community, however, and the amendment was dropped before Tuesday’s vote. It will be considered again as separate legislation. The wage increase measure will now go to the city attorney’s office to be drafted as an ordinance, and then back to the City Council for approval later this year, before finally being signed into law by the Mayor. The first increase to go into effect will push the minimum wage from $9 per hour up to $10.50 in July 2016. The City Council’s 14-1 vote on the measure did not come without inducement. Corporate employers have been reluctant to increase hourly pay rates despite record profits, and have left it largely up to politicians to try to solve the problem of stagnating wages, as the cost of living continues to increase. 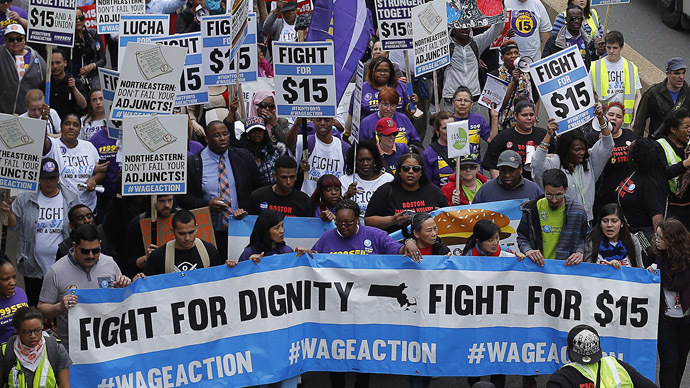 The much-publicized efforts of the Service Employees International Union to support fast food workers in their quest for a $15 wage have been effective in raising the bar for wages. As part of the campaign, it publicized how corporations have been relying on state subsidies, such as food stamps and housing support, to supplement their employees’ wages. Critics, many of them business leaders, say the increase will turn the city into a“wage island,” pushing businesses away into places outside the city limits where they can pay employees less. “They are asking businesses to foot the bill on a social experiment that they would never do on their own employees,” Stuart Waldman, president of the Valley Industry and Commerce Association trade group,toldthe New York Times.